0.5 μg of Human Anti-C5 Antibody, MCA6103 (eculizumab biosimilar, research grade) was denatured and analyzed under reducing (R) and non-reducing (NR) conditions. Bands were visualized using Coomassie Blue staining. Full IgG (H2L2), heavy (H) and light chains (L) are indicated. 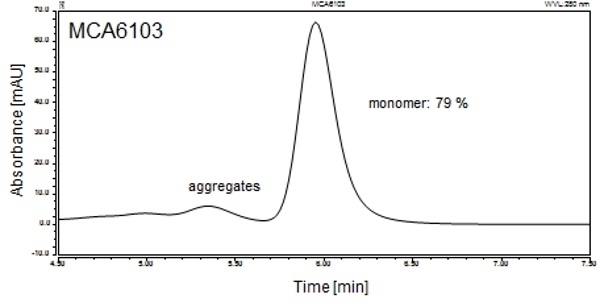 Size exclusion chromatography (SEC) of Human Anti-C5 Antibody, MCA6103 (eculizumab biosimilar, research grade) was performed on an analytical HPLC instrument. Shown is the monomer peak (H2L2), calculated relative monomer portion and aggregates. Column: MAbPac SEC-1, 5 μm; dimension: 4.0 x 150 mm; mobile phase: 50 mM sodium phosphate, pH 6.8, 300 mM NaCl, 200 mM Arginine; flow rate: 200 μl/min; inj. volume [μl]: 3; temp. : 25 °C; detection: 280 nm; sample: mAb (1 mg/ml). Anti-C5 Antibody is a non-therapeutic biosimilar of the monoclonal antibody drug eculizumab (Soliris) for research use. It can be used in bioanalytical assays and for studying biological pathways affected by the drug. Human Anti-C5 Antibody is a research grade biosimilar of the monoclonal antibody drug eculizumab. 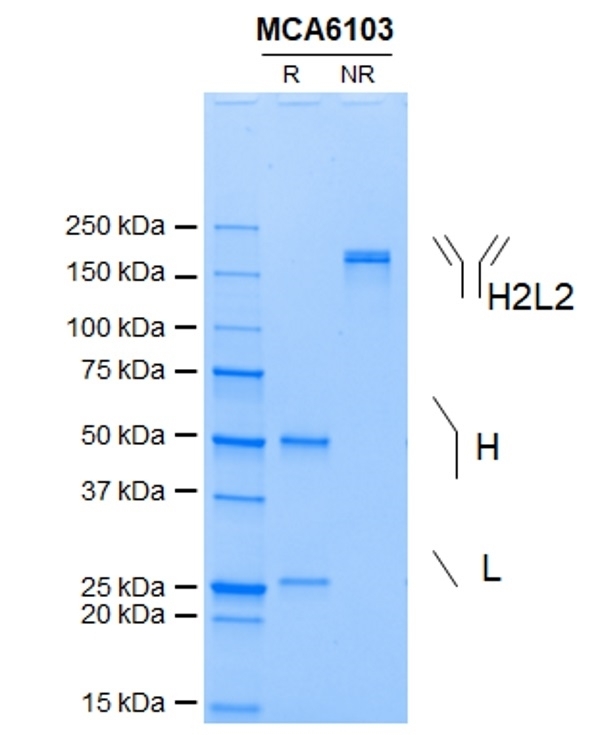 It is a recombinant human IgG2/4 kappa antibody with variable regions from the therapeutic antibody eculizumab. Human Anti-C5 Antibody is for research use only. It is suitable as a reference standard in a pharmacokinetic (PK) bridging ELISA with anti-eculizumab antibodies. It can also be used as capture and detection reagent in an anti-drug antibody (ADA) bridging ELISA, with an anti-eculizumab antibody in IgG1 format as reference standard.